When I started my career in one of the largest Personal Finance Companies, my supervisor always persuaded me to get more army customers because of my background. In fact, if an agent has army clients, he was given more respect and was thought to be well established. Later on when I got the understanding of sales, then I came to know that the simple reason was Defense Personnel were very easy targets of mis-selling and since they had very little understanding, agents and distributor milked them for what they were worth. Like every individual, they also need Financial Planning and also needs to take care of his finances. The very aim of writing this piece is to convey that the outside world is ready to sell you all that you do not require with no proper understanding of your requirements. Beware! D. Insurance – There is nothing in this world that can fill up the social vacuum that gets created if one is not there, but there are other issues like financial loss which can be recovered through insurance. There is some provision of family pension & some insurance on death of defense person but that’s very small. Insurance is one of the greatest inventions in the field of personal financial products but it becomes fatal to financial life and costly once you endup purchasing a wrong insurance solution. You should not buy endowment or ULIP policies for insurance need. You should take help of some professional to calculate your insurance needs and take term plan & accidental policy to cover them. You don’t need health insurance during your job but once you retire, you should immediately buy a decent mediclaim policy for yourself and dependants. How many times have you asked your relationship manager in your bank/your Mutual Fund or Insurance agent that “What’s new in the Market”? Let’s take it other way – How many times you have been approached by your Relationship manager in your bank/ your Mutual Fund or Insurance Agent that “This is new and improved product and you should definitely invest into that.” I don’t need any answers and neither do you have to SMS something to any number to win prizes… this is only for you to realize that both of the above styles are wrong approaches, which does not take into account a persons need to investing. Every other Financial Company is coming up with new products and trying to collect money from investors in different ways. Especially Insurance companies, which normally design a product to appear emotionally attractive to a customer that if pitched properly by an Agent, he could close the deal in first meeting. But if that product is suitable to your long/short term needs, then why after 3 or 5 years you receive call to cash out and invest in another product? Do you think that buying a pension Plan or opening a NEW PENSION SCHEME a/c is the only solution to your Retirement needs or are you sure that buying a children plan can only help you to achieve your goals of Child education and Marriage. Some days ago I met with a person who showed me his past investments, which include almost 50 mutual fund schemes, 14 Insurance policies (8 Traditional Endowment Plans and 6 ULIPs), as also PPF, MIS and NPS a/c. On asking why have he invested in so many products – The answer is very common, he said – “some of the time I asked for something new and some times my advisor brought something new. I have bought Insurance policy for every member of my family to provide them security…” and many reasons for other. In the nutshell as per him He’s done Diversification of his Investments as he was told by his advisor “Not to put all eggs in single basket”. I m sure many of you can relate yourself with this person. Now a days all the Regulators be it SEBI or IRDA, are laying stress on Financial Literacy of the Investors, Training and strict regulations on advisors and above all changing the structure of products to make them more meaningful and beneficial to a Investor. 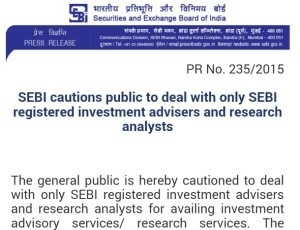 Every other regulator and investor is blaming advisors for mis-selling but I personally don’t agree with this. According to me for mis-selling of products besides Agents and product manufacturers, investors are also responsible. They themselves have to be financially literate to be able to ask for the right products, as the right questions and be in a position to make the right choices. Diversification does not mean investing in different products. It means investing in different sectors so that if one sector goes down other should compensate for it. So next time your advisor tells you to put in a new product for diversification, show him the door. You must be aware of the Asset Allocation of your Portfolio. Ask your advisor for that. Please understand there are only 4 Asset classes: Equity, Debt, Gold and Real Estate. The Allocation to these assets in all forms constitutes the asset allocation. To be More specific “In All Forms” means that if you have some equity oriented Mutual funds , ULIP with 100 % equity Investments , PMS product and nothing else than you have 100% allocation in Equity. Along with understanding of asset allocation you must know the reason why you have allocated in such a way. Also ask for the Risk and Return associated with different asset classes. Before Investing in a new product, do find out where the money will be invested and how that would help you in your asset allocation or diversification. If there’s nothing new besides the name and Company, avoid that product. It’s always better to set goals first before starting any Investment. Tell your advisor to arrange your investments in such a way that you can easily reach your targets. This will help you to fix a time line to your Investment product and which gives you a better view when to start and when to stop and why. There are very few people who are following Financial Planning, but those few are more relaxed and managed than others. If your Advisor can help you in Financial Planning, that would be the ideal situation. Financial Planning means arranging your Finances which includes your Loans, Credit cards , Investments , Insurance etc. and all other things that effects your personal finance in such a way so that you can achieve your Goals comfortably. Look out for CFP Professional if you really need Financial Planning. This is the most important of all. To maintain the Loyalty of your Advisor towards you and not towards the product manufacturer, to make him more responsible towards your needs and goals and to get best of his services, it’s better to pay the advisory fees. Remember a Financial Planner may change your world and help you reach your target by making you Invest in suitable products, taking into consideration your risk profile, your Life Targets and the changing tax laws. But to get the best out of him you also need to know some basics on your Finances, what you need to ask and how to choose an advisor. Finding financial advisors or sales representatives who call themselves advisors, is easy. They are seemingly on every street corner. More than 50 Lakh people in India sell investment and insurance products. The low entry barrier for selling the financial products has ensured that anyone at all can become an advisor. The basic expectation from an advisor is that he would offer unbiased advice. But recent interventions from regulator about fixing the code of conduct for these advisors in many industries, has clearly indicated the gap. They have become part of the problem and not the part of solution. You would be shocked by reading my last sentence… but it’s true. How then can one find a proper Financial Advisor? Let me share few points which will help you to find your financial advisor. List can be long… but let me keep it simple & stick to top 3 points, which merit attention. Someone rightly said “To a man with only a hammer, every problem looks like a nail.” For all your financial needs be it- Saving, Children Education or your Retirement Planning an Insurance Agent will be ready with a Policy. Also the agent obviously will only promote his company’s product and may not even know much about other company’s offerings. Similarly with mutual fund agent he will hate to talk about post office schemes, corporate FDs or Bank FDs. Has any advisor ever told you that you should repay your loan first & then think of investment or you should keep some amount for emergency needs in a savings bank account or liquid fund. Your advisor should follow one principle – “people have one thing in common that they all are different”. He should not try to fit the person into an already tailored coat. He should look at every aspect of client’s financial situation. That’s the only way to give truly customized, comprehensive advice. Is your Best Interest his Only Interest or something else is cooking in his mind when he is talking to you. Is he thinking about his monthly target or yearly bonus which is dependent on an expensive product being sold to you? If your advisor is working with any bank, brokerage firm, mutual fund house or insurance company, there is a good chance that your goals & requirements are on back burner. His sales pitch is derived/motivated from something else. This type of advisor is very dangerous for any individual. Try to search for an advisor who is genuinely interested in your goal & long term relationship with you. His ethics should guide him rather than his boss & company. So if you are looking for above mentioned 2 qualities you will mostly end up finding an Individual Financial Planner – but In India the term ” Financial Planner” has been in confusion for quite some time now. In the absence of any local regulation or guidelines, anyone can call himself a “Financial Planner” without having the necessary training, education or certification. There are so many individuals who decide to start putting the term “Financial Planner” in their business cards leaving the public more confused. So here comes the last point which is equally important. Have you ever tried to find out that what is the education, knowledge & experience of the advisor who is guiding you? Warren Buffett quoted “Wall Street is the only place people ride in a Rolls-Royce to get advice from people who ride the public transport.” That’s true in India also I have seen many people taking stock advice from those who are sitting on terminals or brokers which have zero knowledge about Investments. Employees from bank who have just joined after completing their management course will pose that they know everything related to investment world & they are masters in it. Best way to find a right advisor is to shortlist few advisors that you feel have good knowledge. Draw a questionnaire – ask some questions that will help you to analyze them. There is nothing wrong in asking these questions. Along with education and experience, ask about his association with financial companies. Is his earning linked to his performance and if yes, by how much? These questions will answer your concerns over his advice. Finding a good advisor is time consuming but this will decide your financial success. Try to find a good advisor that’s right for you.